As you enter this historic property enjoy the shade and grandeur of the heritage Cypress, thought to be at le ast 100 years old. Many mature trees give character to this cottage garden with beds featuring bulbs, roses and a variety of mixed border plants. 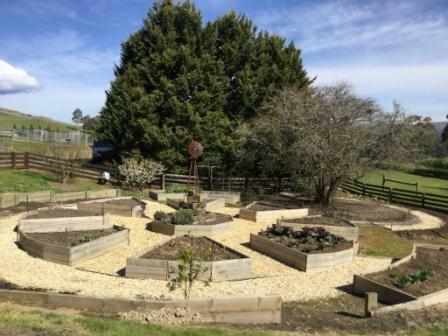 Radiating raised beds forming a circle, produce an abundance of vegetables enjoyed by the whole family and their many visitors and is one of the features of the garden. 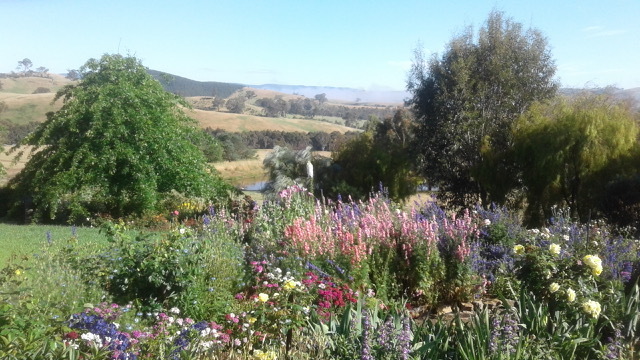 The McKay family have occupied the farm for 12 months with the family vision of running a small herd of cattle and sheep along with a garden that shines throughout the seasons and provides seasonal produce. Our gardener, David Ralph, has endeavoured to add colour, function and structure to the garden. Many changes have been made including relocating a number of fruit trees in the rear garden to enhance a more open view to the valley. 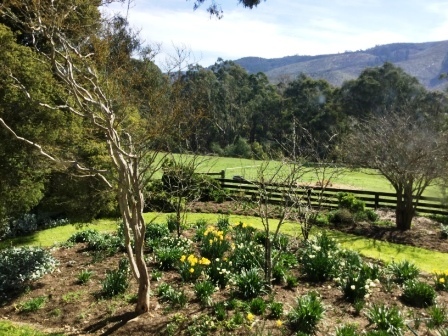 The views from a number of points in the garden showcase the natural beauty of the area. Owners Glenys and Jim Osborne. 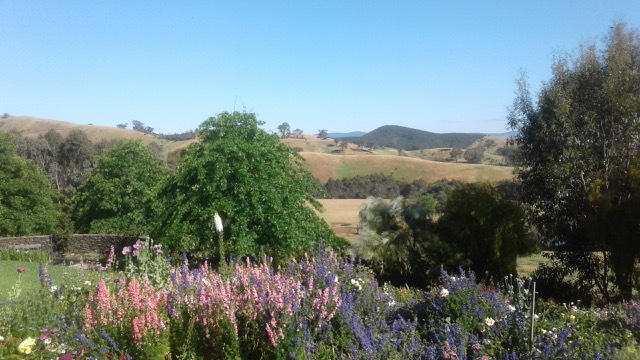 This garden is now showing signs of maturity after having been started in a bare paddock approximately 16 years ago. 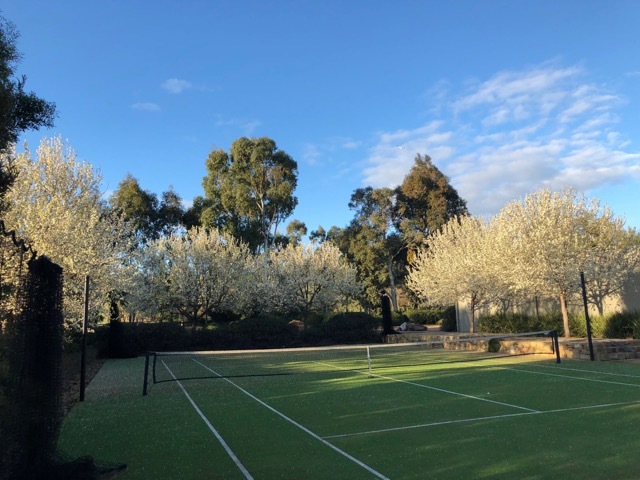 Many mature ornamental trees have reached height and breadth and throw shaded areas, which in recent years, have created the necessity for different types of plantings. Roses still abound in their hundreds creating waves of colour. Tall bearded irises, daisies, salvias, agastache, lupins, foxgloves and other old favourites still find plenty of sun also. However with the increased shade areas camellias, heucheras, hellebores, azaleas and other shade lovers have found more places to flourish. 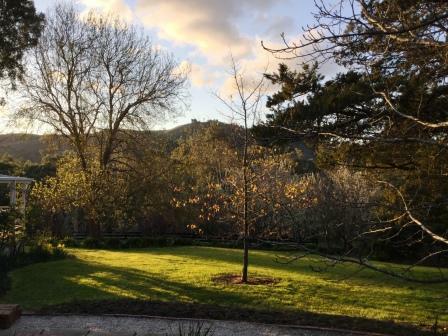 Paddocks have been removed from around the front of the homestead and this area is now lawn and more ornamental trees, allowing the lake to be included in the garden area. 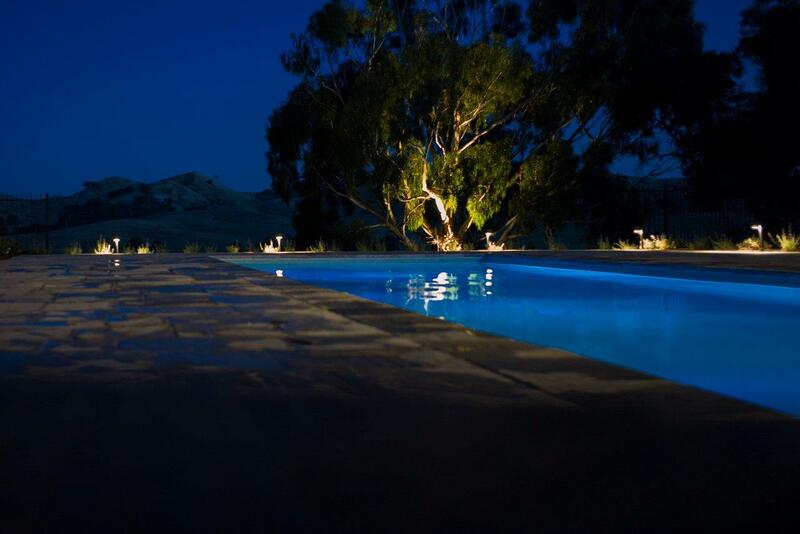 It offers many seating places for quiet contemplation and creates a landscape type setting for the homestead. A creeper covered picnic area by the lake is a scenic spot for a coffee. Due to the garden pond becoming choked by waterlillies the pond area has, this year, had a major makeover. As a result growth in this area is still filling out but shows promise for the coming years. The new bridge creates a soft, romantic appearance. The produce garden with vegetable bins and fruit trees maturing is productive and offers much produce to share with family and friends. Two glasshouses and a shade house are busy helping cuttings from the garden to propagate mainly over winter and create happy atmospheres for hippeastrums, orchids, ferns, seeds and garden plants to flourish before being planted out. A plant stall, BBQ lunches, morning and afternoon teas will be available. Waiora is a six and a half acre property situated on the top of a rise within the larger Strath Creek valley, the Valley of a Thousand Hills. The ground is rocky and firm. The house was constructed by the Lade family around 1930 from three original Victorian dwellings that were situated in the low lying area on the other side of Falls Road. 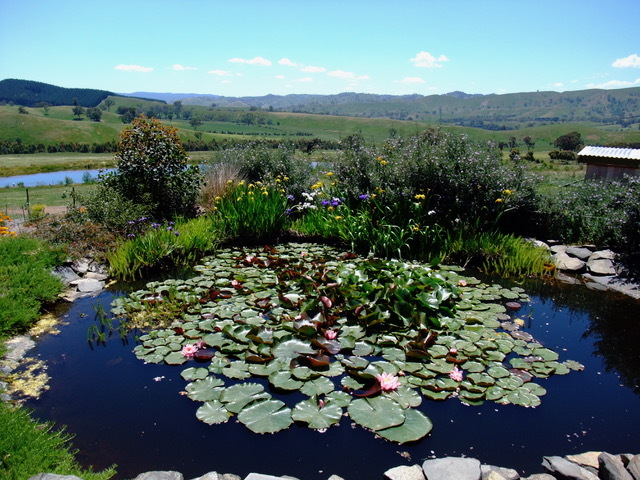 Waiora’s garden, designed to offer delights in every season, was established by previous owners Euan and Sharyn McDonald and over the past eight years has been added to by the Harts. 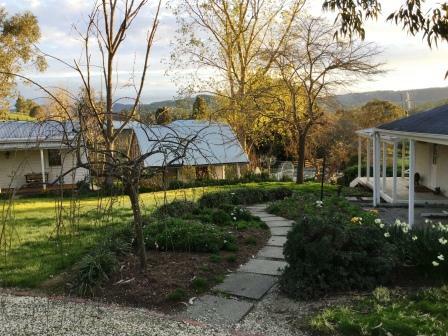 The planting was generally informal within the framework of eucalypts, various shrubs and small tress and the borrowed scenery of the surrounding hills. In 2016 plans to build a swimming pool and to formally landscape the eastern and southern sides of the house came to fruition. 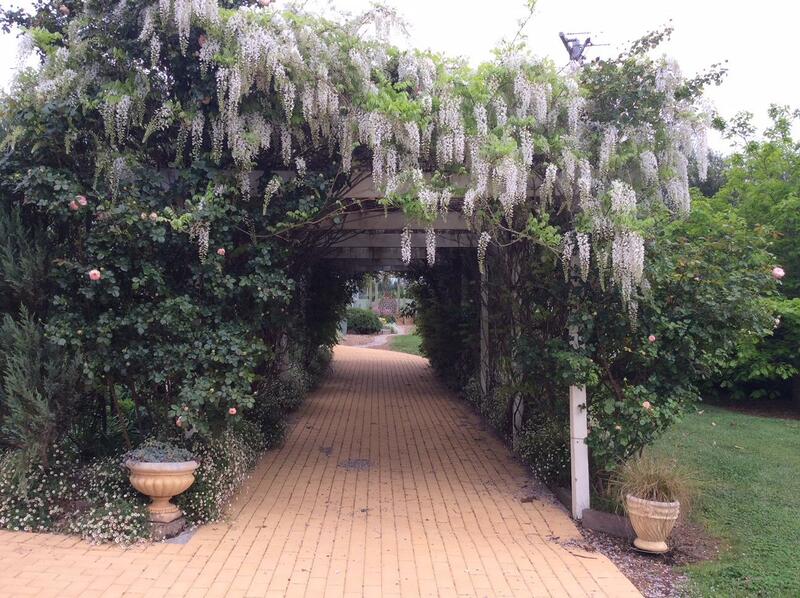 The experience was captured by ABC TV in their ‘Dream Gardens’ program. Paul Bangay was the designer and with excellent workmanship by our contractors the result has been a marvellous success. There is now a superb perennial border, at its finest in autumn, a central lawn and large patio incorporating an original wisteria. 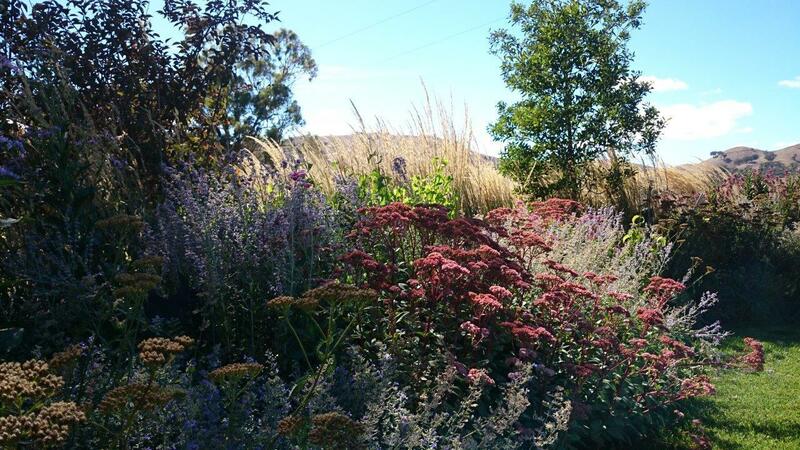 The pool area overlooks the valley to the east and during summer the borders of Rosa rugosa Rugspin and Nepeta Dropmore provide the perfect balance. Raised gardens behind new stone walls to the south are home to Japanese Maples, Crepe Myrtles and Crab apples with hydrangeas, abutilons, and perennials making up the understory. The informal west and north gardens will be familiar to those who visited in 2013 with an emphasis on roses, perennials and annuals. In late winter to early spring these gardens come to life with hellebores, hundreds of bulbs – snowflakes, narcissus, iris reticulata, iris histrioides and muscari. In late spring the highlights will be colourful roses, lavenders, tulips and irises. 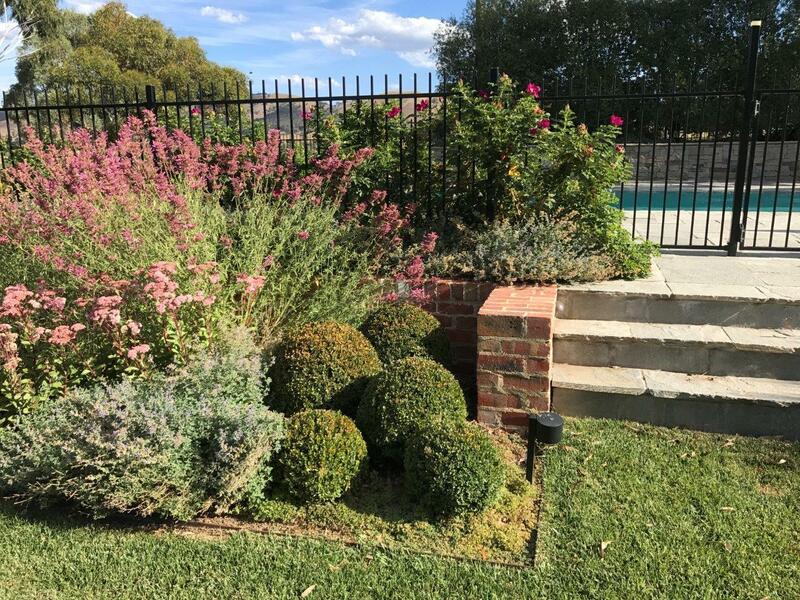 In addition to the decorative garden an espalier citrus grove, just holding its own adjacent to eucalypts, a small hobby vineyard, numerous veggie patches and a new stone fruit orchard provide a bounty of food. Composting bays, located behind the Cyprus trees, old Gedye bins and a worm farm process most of the waste from the garden and household for return to the garden. 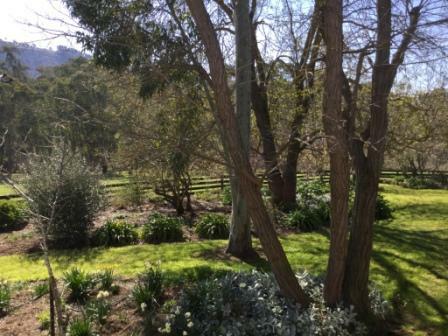 The garden lives in symbiosis with wombats, rabbits, rosellas, cockies and magpies, sometimes showing the effects. 62 Upper King Parrot Road, Strath Creek. 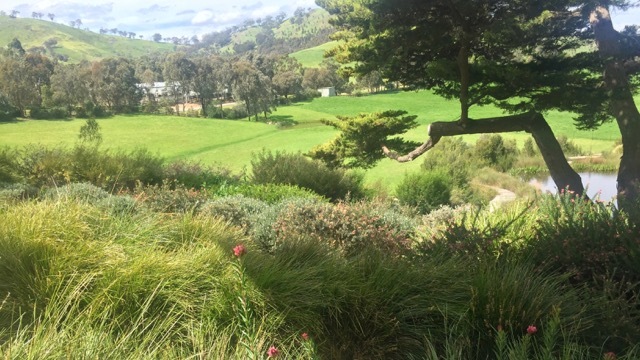 T he garden at Callandoon was originally created 30 years ago under the guidance of Melbourne based landscape architect, Ric Day. It h as been subsequently expanded and evolved, most recently under the careful and inspirational management of Gary Grech with some assistance from Formation Landscapes under the direction of Chris Weiss. Callandoon is situated in the so called “Valley of a Thousand Hills” on the banks of the King Parrot Creek, which, at this time of the year, is a babbling brook with still ponds and water tumbling over rocks. The stonework, gravel driveway and paths have been constructed with local material to reflect the colour palate of the natural environment. 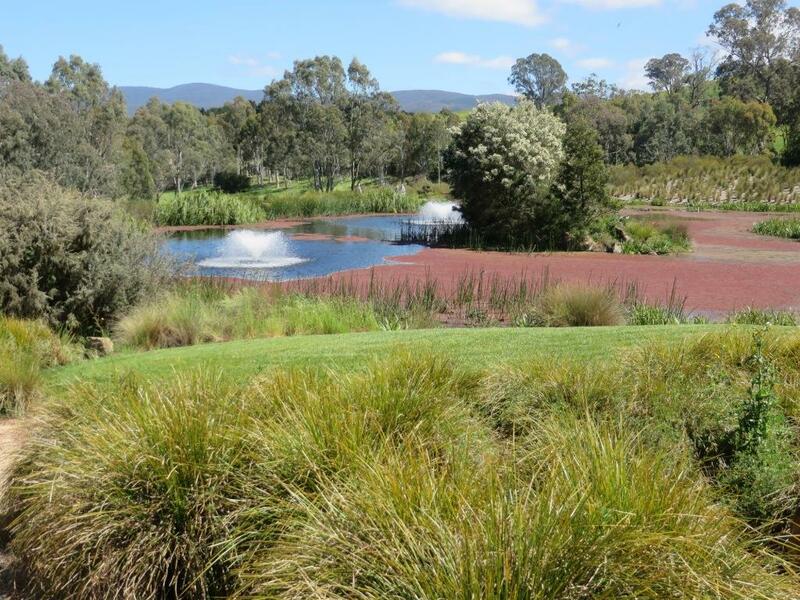 The planting has been designed to integrate with the environment through the choice of native plants and grasses and the construction of the undulating lawn and the carefully trimmed shrubs that echo the surrounding hills. In addition, some exotic trees, most specifically Chinese Elms, Cornish Elms and English Oaks, have been used to line the driveway and paths and as features close to the main house. 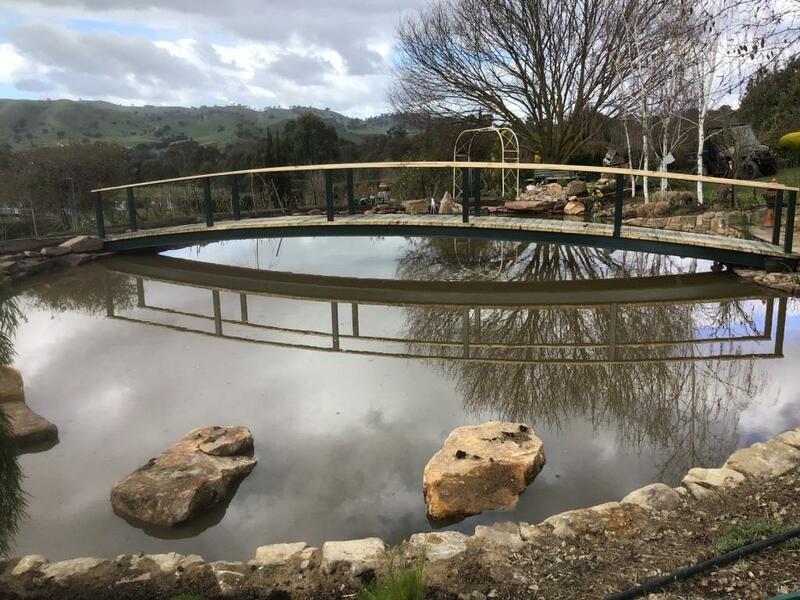 The substantial garden includes two large wetland/water features specifically planted to attract native fauna and is a haven for many types of water birds, frogs and fish. The section of the creek immediately below the house has been successfully protected to promote the breeding of the endangered Macquarie Perch, evaluated regularly by the Arthur Rylah Institute, and is also an excellent environment for the many platypii that thrive there. 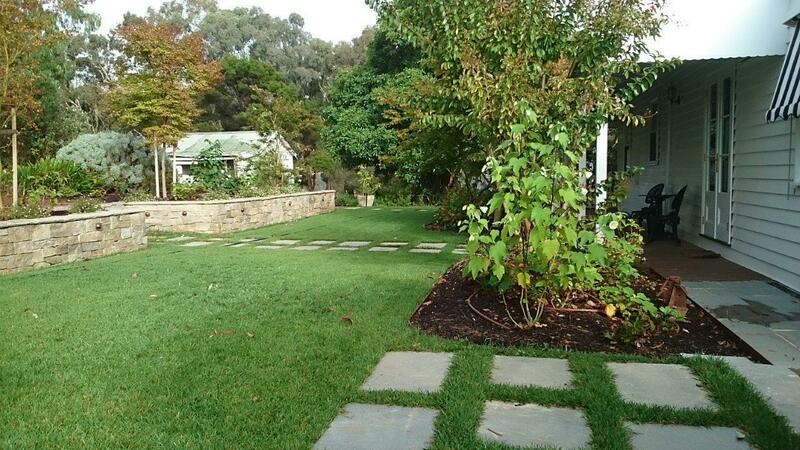 A long curving Ha Ha wall separates the cultivated lawns and garden from the water feature below and is a novel treatment of the gently sloping land. 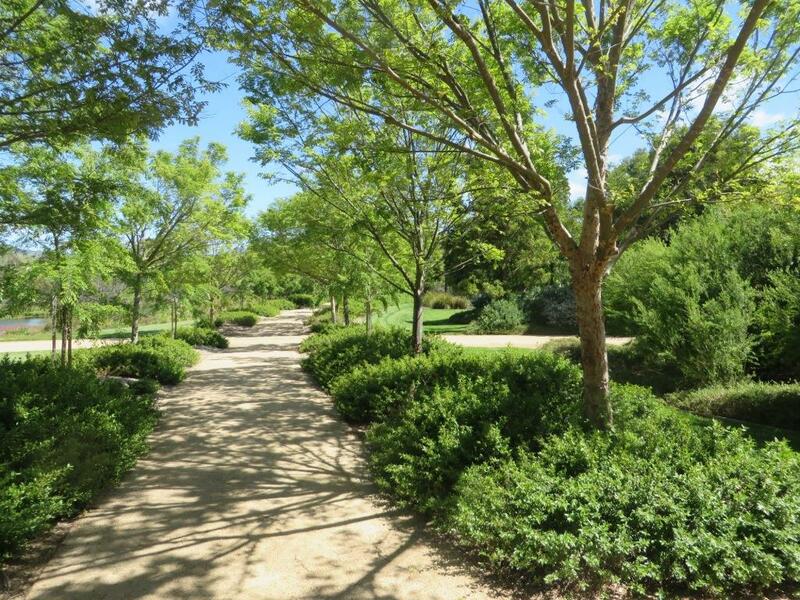 A labyrinth of paths facilitate picturesque walks on which to enjoy this beautiful garden. 2548 Broadford/Flowerdale Road, Strath Creek. In 1997 when D avid Ralph and Rosemary Simon bought the property, Wingspread had 5 mature trees. The site development, the large pond, the paths and driveways were carried out and trees were planted around the boundary of the 110 acres. The orchard, now 40 fruit and nut trees, was planted. The first building was the shed and in 2001 the round straw bale house was begun. In the meantime the garden began to develop. 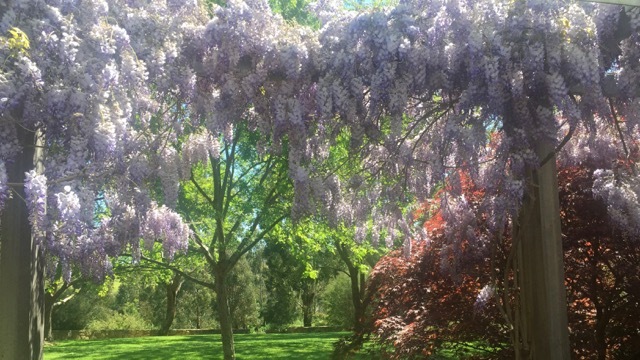 The garden at this present time could be described as a cottage garden with its collection of irises, roses, native plants, crab apple trees and many and varied plants which blend and harmonize on sloping banks, in a large rockery and along the paths and driveways. All year round there is some colour, but late Winter brings the bulbs. Beneath the white trunks of the silver birch trees, daffodils, jonquils and anemones bloom and the Crab apple trees shelter Helibors. Blue star flowers crowd the wall of the pond. From Spring to Autumn the garden is at its colourful best. The blossoms are a picture, the roses begin their display and the irises show off their stunning colours. 2752 Broadford/Flowerdale Road, Strath Creek. Owners: Terry and Janet Hubbard. The house at The Three Sisters took three years to build and while the builders were constructing the building we were busy working on the bones of the garden. We started with a circular drive, something we have always wanted. Extra stone from the 1860s granite cottage which we have rebuilt here as part of the house provided a starting point for rock walls and garden edging, which have become a feature of the garden. A circular lawn in the middle of the drive is echoed by the circular rose garden in front of the house. 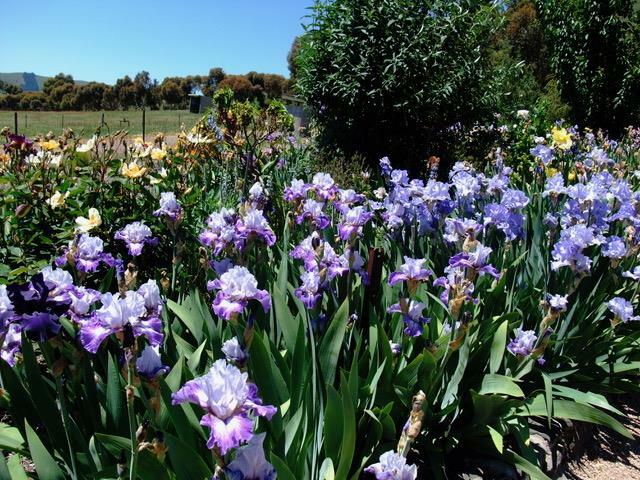 Irises are a special interest and each year more are added to the collection. We try to have lots of spring colour so we have planted, as well as irises and roses, old favourites such as foxgloves, pansies and delphiniums. A recently installed sprinkler system allows these plantings to thrive in spite of the due north and exposed situation. There are a number of water features in the garden, including some designed to attract frogs. 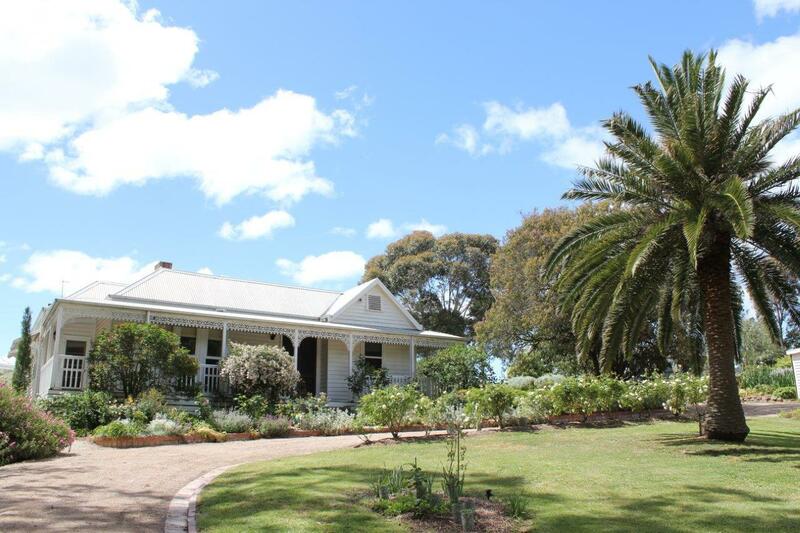 We also have a glass house with orchids, an outside fernery, and a vegie garden which is fenced in to deter rabbits. The garden has been extended twice but we are now concentrating on improving it each year and adding new and different plantings. Some major renovations to the garden have been taking place since last year’s opening and is still a work in progress. 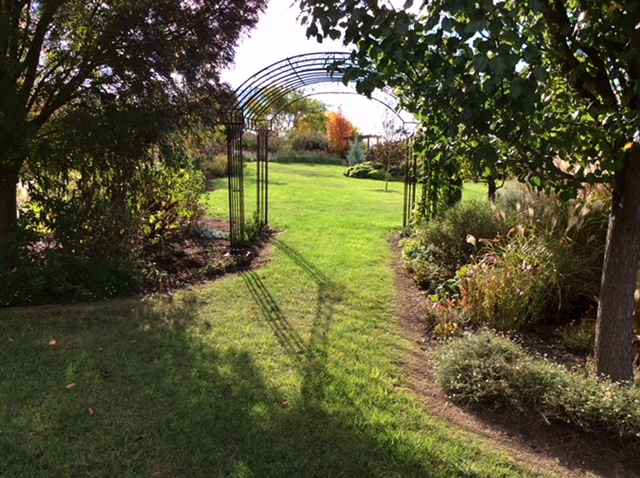 The west side of the garden has been extended and new rock walling and mass plantings will be watched with interest by garden lovers over the next few years as this exciting new development matures. This garden is continually changing. Morning and afternoon tea will be available and there will be a plant stall. Please note please bring your own bags or boxes for the plant sales as plastic bags as no longer in use.